Lightning Bolt Solutions representatives Suvas Vajracharya, founder and CEO, and Rachel Worsham, sales & marketing specialist, accepted the IHA award on behalf of iNDIGO Health Partners. We employ about 125 providers now and pride ourselves on an exceptionally low turnover rate of less than two percent annually in an industry that often sees turnover of 20 to 25 percent. 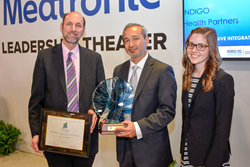 iNDIGO Health Partners, a leading private hospitalist medicine group based in Northern Michigan, has announced receiving the 2016 Comprehensive Integration Award from the Intelligent Health Association (IHA). The IHA recognized iNDIGO for its work with Lighting Bolt Solutions to prevent physician burnout and sustain a 97.6 percent retention rate for medical staff while also tripling in size over a period of five years. Serving six rural community hospitals, iNDIGO Health Partners is one of the country’s largest private hospitalist groups. The group provides 24-hour adult care in all six hospitals with pediatric care at one facility. Before partnering with Lighting Bolt in 2008, iNDIGO oversaw 37 providers across two programs using a full-time equivalent physician to manage the schedule. The physician scheduler worked over 1,000 hours a year manually setting schedules with little flexibility to change the schedule once it was created given the 7-on, 7-off block structure. Scheduling healthcare providers in a rural region, where limited access to physicians added a layer of complexity, proved to be overwhelming for a manual scheduling solution. Lightning Bolt’s flexibility allowed iNDIGO to consider physicians’ individual and evolving work-life balance preferences. Over the course of the partnership, iNDIGO Health Partners reports having gained $38 million in ROI by optimizing and automating their physician scheduling with Lighting Bolt Solutions. "iNDIGO Health Partners is grateful for this award and pleased to share it with our colleagues at Lightning Bolt,” said James Levy, PA-C, SFHM, iNDIGO's VP of Human Resources. “We employ about 125 providers now and pride ourselves on an exceptionally low turnover rate of less than two percent annually in an industry that often sees turnover of 20 to 25 percent. We attribute this in part to our scheduling system which uses the Lightning Bolt product to maximize scheduling efficiency while giving each provider as nearly as possible the schedule he or she wants. The stability and provider satisfaction this creates enables us to better serve the needs of multiple small, rural hospitals and thus to make inpatient medical care more available to many patients who would otherwise have trouble accessing needed services." Lighting Bolt Solutions goes beyond managing physician shift schedules to improve the interaction between provider and hospital. The system auto-generates the best possible physician schedules while balancing hundreds of different operations rules across multiple programs and facilities. Changes and time-off requests are efficiently handled through the system while every user can access the schedules in real-time online and via mobile. Improved communication capabilities led to higher levels of transparency and flexibility that resulted in the advancement of work-life balance and hyper-efficient provider utilization of data across the board for iNDIGO Health Partners. iNDIGO and Lightning Bolt participated in the Intelligent Health Association Awards ceremony at the Healthcare Information and Management Systems Society (HIMSS) 2016 conference held earlier this month. For more information on physician scheduling best practices, please visit http://www.lightning-bolt.com. Based in Traverse City, Michigan, iNDIGO Health Partners is a leading private hospital medicine group. Founded by hospitalists and led by experienced healthcare professionals, we are driving innovative solutions that enable community hospitals to remain sustainable by meeting the challenges of today’s healthcare environment. Lightning Bolt Solutions is the leading provider of automated physician scheduling for hospitals and health systems around the world. The company manages over 3 million physician shift hours each month, helping to create schedules that promote work-life balance, productivity and patient safety.